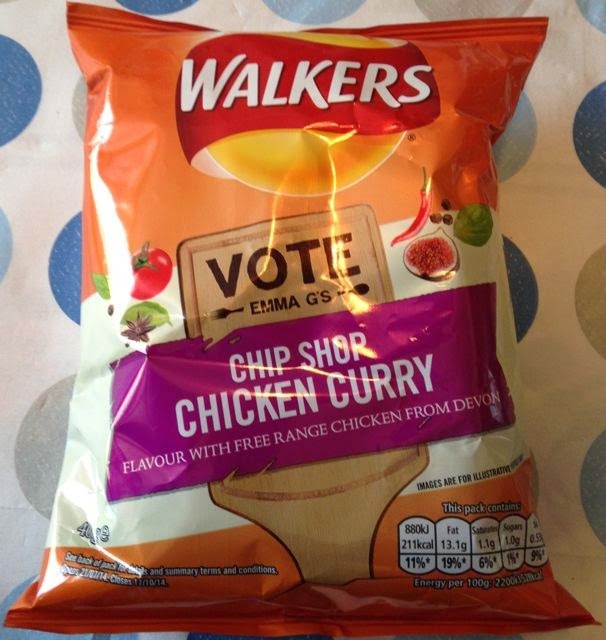 Next up in the great taste test of the new Walkers flavours are these Chip Shop Chicken Curry ones. As someone who is a big fan of both meaty and spicy flavours I couldn’t wait to give them a try. I opened up the bag and discovered a lovely curry powder aroma and the crisps seasoned with a yellow looking powder. The flavour was spot on and reminded me perfectly of the curry sauce you get in chip shops. There was just a mild tingle of heat, but it was all about the flavour. There was lots of curry powder, some salt and that creamy hint of Korma without any kick form a fiery chilli. This is true to form though, chip shop curry sauce isn’t usually hot, it is just full of flavour, and these tasted really good. I was munching away on these flavoursome crisps I glanced over at the bag and realised the full title of the crisps, Chip Shop “Chicken” Curry, and noticed I couldn’t pick up on much, if any, of the chicken flavour. Had they been called Chip Shop Curry Sauce they would have absolutely spot on, but the chicken element being so indistinguishable meant the flavour dropped some points in the taste test. Imagine ordering a cone of chips and asking for curry sauce liberally splashed all over it, that’s what these taste of, and they are pretty fine crisps too in that respect. Now I think about it, can you even get chicken curry from chip shops?